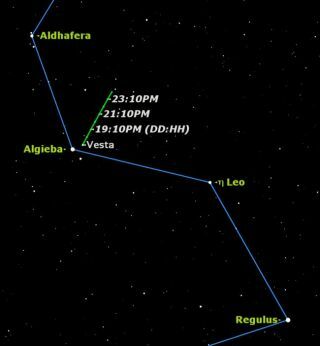 The brightest asteroid Vesta reaches opposition this week right next to the beautiful double star Algieba. Haveyou ever seen an asteroid? If not, this week is an excellent time to do so: Vesta, the brightest asteroid, will be well placed forobservation with binoculars in the constellation Leo. Vesta was discovered in1807 by Heinrich Wilhelm Olbers. An active Germanastronomer, he also discovered the asteroid Pallas and a comet named after him,but is most famous today for stating Olbers? paradox:the darkness of the night sky conflicts with the supposition of an infinite andeternal static universe. Vesta is the secondlargest asteroid, after Ceres, and by far the brightest, having a greater albedo (percentage of light reflected) than any otherasteroid. This seems to be partly the result of a collision with anotherasteroid about a billion years ago. Its mean diameter is 329 miles (529 km),but it is rather irregular in shape because of its violent history. Vesta is at a point in its orbit called"opposition," which is its closest approach to Earth, NASA officialssaid in a statement. At high noon on Wednesday, when the sun is over your head,Vesta will be about 131,700,000 miles (211,980,000km) below your feet, they added. Unlikesome other asteroids, Vesta also has a brighter-than-typicalsurface (the albedo) which makes the space rockreflect more sunlight and stand out more to observers, NASA officials said. Thisweek Vesta will be traveling rapidly through Leo. Itwill be around magnitude 6.2, bright enough to be easily visible in binoculars.However, because of its small diameter and distance, it will appear as astar-like point of light except in the very largest telescopes. Whatgives Vesta away is its obvious movement from nightto night against the starry background. Youcan find Vesta tonight very close to the popular 2ndmagnitude double star Algieba (Gamma Leonis). Leo looks like a right angle triangle on the leftand a sickle or reversed question mark on the right, as seen from the northernhemisphere. Algieba is the second star up from thedot under the question mark, the bright star Regulus. Vesta will be visible in binoculars just tothe right of Algieba tonight, forming a tinyequilateral triangle with Algieba (magnitude 2.0) and40 Leonis (magnitude 4.8). Over the next few nightsit will travel to the right, stretching this triangle out. The chart shows Vesta?s position each night at 10 p.m. EST over the nextweek. Makea simple sketch of these three ?stars? over the next few nights, and Vesta?s movement will be obvious. Youwill be able to follow Vesta?s motion over the nextfew months by plotting its position in Starry Night. Ifyou look at Vesta with a small telescope, be sure tocheck out Algieba, one of the prettiest double starsin the sky. Vesta is one of two asteroidtargets for NASA's Dawn spacecraft. The ion drive-powered probe is headedtoward the asteroid belt to swing by Vesta in 2011and Ceres, which is big enough to qualify as a dwarf planet.